Chocolate Circle is a shop of food-themed products based in this small yet spectacular city of Hong Kong. It is founded and run by a group of obsessed chocolate lovers who love chocolate and desserts to the extend that they want to live their lives surrounded by chocolate. Thus, they have laid hands on so many unique and “delicious” chocolate-themed and food-themed products. They have decided to compile them all together on a website hoping that, through the form of a shop, they can meet people from around the world to share their craziness for love of food. How do I order from Chocolate Circle? Ordering is easy! Follow Steps 1, 2, 3! Browse our wide range of food-themed products by keywords and shortcuts from the main page or search with keywords on the right side on all pages. Don’t forget to click on product images to enlarge to see product details. Click the “Add to Cart” button of the item you’d like to order. Some items come in different colors, “flavors”, themes or shapes. There is a different separate button for each choice. If a button is not available for a certain choice, that means it has been sold out. Your shopping cart sits near the top of the right-side bar on each page. Change the quantity of each item by changing its number in the quantity field then press “enter” on your keyboard. It will update your new quantity to your cart automatically. Click the yellow “Check out with Pay Pal” button and you will be directed to PayPal’s website to log in to your PayPal account. An invoice is automatically generated to you and you can make your payment to us directly with just a few clicks. You can pay with or without a PayPal account. Chocolate Circle does not process your PayPal log in and payment procedures. Congratulations! You have made your order with us! We offer FREE shipping worldwide! We stand behind what we sell. Although all sales are final, we allow replacement within 180 days from your date of purchase for any manufacturing defects! Feel free to email us with any questions about our products. Your satisfaction is our #1 priority. 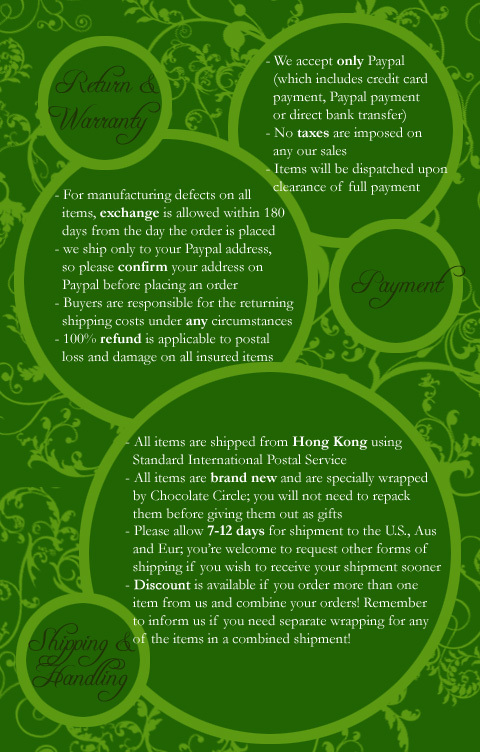 Please read below for further details about payment, shipping, handling, return and postal insurance. Do you offer free shipping to international orders? Yes, we surely do! We offer free regular air mail shipping to all addresses! Just follow our simple steps to order, sit back and relax and your package will be on its way to you whichever part of the world you are in! Can I have my item(s) gift-wrapped? Of course you can! With a small cost, you can have your item gift-wrapped in Chocolate Circle’s unique and stylish gift-wrapping for your loved-one. If you would like to request for gift-wrap, please click here. Can Chocolate Circle send my item(s) to a different address? How long will it take me to receive my package? Where can I do tracking for my package? We offer free shipping by regular air mail which does not include tracking information for packages. If you add a mere US$1.75 to have your package registered, you will be provided information to track for your package online. If you would like your package registered, please purchase shipping insurance here. If you have purchased registration for your package, you can track your package here. Is it safe to purchase from Chocolate Circle? We do not take any credit card or bank account information from our customers. All payment transactions are completed on PayPal. PayPal is a global leader in online payment solutions with more than 153 million accounts worldwide. They provide a safe and easy way to pay online allowing you to pay in any way you prefer, including through credit cards, bank accounts, buyer credit or account balances. PayPal protects your financial information with industry-leading security and fraud prevention systems. When you use PayPal, your financial information is not shared with the merchant. Once your payment is complete, you will be emailed a receipt for this transaction. If you need more information about Paypal or wish to sign up for an account now, click here. If you are familiar with eBay and you feel more comfortable with making your purchases there, visit our eBay store at http://myworld.ebay.com/chocolate-circle. We have been selling our products on Ebay for over 10 years since 1999. Chocolate Circle selects with heart only products we deeply love and adore to add to the selection we carry in our shop. We have served customers from the United States, Italy, France, Australia, New Zealand, Brazil, Switzerland, Russian Federation, Portugal, India, and more. Customer satisfaction is the only thing we value more than chocolate. It is always our first priority to clear out any queries and concerns from our customers both before and after their purchase with us. We strive to maintain a 100% satisfaction with Chocolate Circle from our fellow chocolate-loving customers. Please feel free to visit our eBay page at http://myworld.ebay.com/chocolate-circle. Can I talk to someone at Chocolate Circle?